May 2015 – Up For Some Challenges? 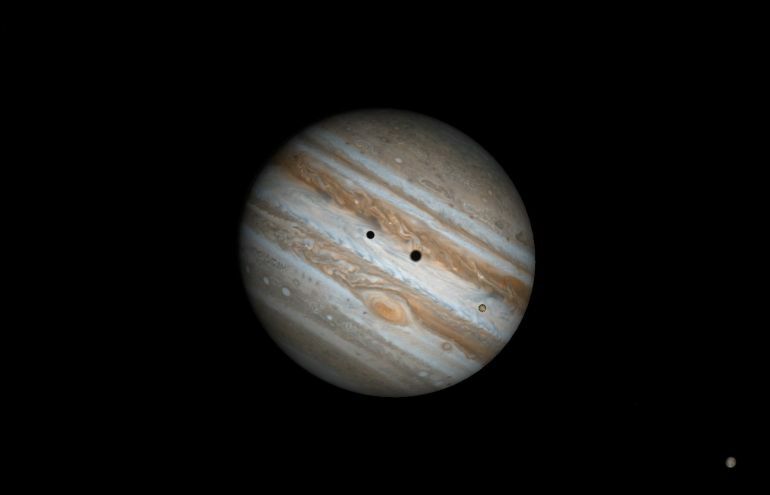 About the image above: Jupiter undergoes a “double shadow transit” on May 27. From 10:01 pm EDT until 12:18 am EDT, the tiny dark shadows of Io and Ganymede are on the disk simultaneously. The moons themselves are visible as well; Io itself is transiting the disk, while Ganymede is in the lower right corner. The Great Red Spot, a huge storm in Jupiter’s atmosphere, has just crossed the center of the disk; for reasons unknown, it has been shrinking and losing color over the past several years. (May 27, 2015, 10:48 pm EDT). May 05- The Eta Aquarid meteors peak (time variable), with an estimated ZHR of 55. May 07- Mercury reaches greatest evening elongation at 21.2 degrees east of the Sun at 4:00 UT. May 19- The Moon occults Aldebaran for northern North America at ~2:53 UT . May 20- Comet C/2014 Q1 PanSTARRS may reach binocular visibility. May 21- Callisto and Europa both cast shadows on Jupiter from 20:06 to 20:36 EDT. May 23- Saturn reaches opposition at ~1:00 UT. May 27- Ganymede and Io both cast shadows on Jupiter from 22:04 to 12:18 EDT. May 30- Comet 19P/Borrelly may reach binocular visibility.